The Young Farmers’ Clubs of Ulster has launched a mascot design competition in celebration of it’s 90th anniversary this year. 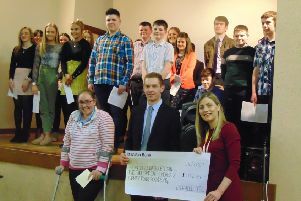 YFCU want to involve members of the Young Farmers in the year of celebrations and make them feel part of this achievement. Therefore, they are inviting all YFCU members to enter the competition for a chance to watch their design come alive as the YFCU’s 90th anniversary mascot and become part of the history of YFCU. The mascot aims to celebrate the spirit of farming while embodying the values and culture of the Young Farmers’ Clubs of Ulster. The design should be an original hand-drawn or digitally designed figure or symbol on A4 white paper. The chosen mascot will be displayed and utilised throughout the 90th anniversary year at events, competitions and meetings. It will be used in print and online format as well as potentially being made into a life-size suit or cardboard cut-out. Therefore, the design should be fun, appealing and be able to be used in all these ways. The participant with the winning design will receive a gift voucher for £250 and will have the opportunity to visit the design agency to watch their design developed and ‘come to life’. The competition deadline is Friday, February 15th 2019 and only members of the YFCU are eligible to enter. All designs must be submitted by post to YFCU HQ or email to laura.mcveigh@yfcu.org. Full competition entry terms and conditions can be found on the YFCU website at www.yfcu.org.